Trevaughn Lewis is a three year old child from Kingston, Jamaica. At three months old, he underwent an operation to remove a large tumor that encompassed his left eye and the soft tissue around the left eye. The operation left him disfigured and over time, without a prosthesis, the tissue began to shrink and deform. Early in 2000 the Hope For Tomorrow Foundation and a team of doctors traveled to Jamaica to perform humanitarian surgery at the Bustamante Children's Hospital in Kingston. Trevaughn was presented to the surgical team and doctors there requested he be brought to the United States for reconstructive surgery. 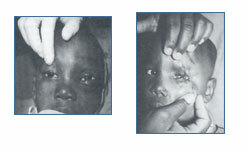 The Hope For Tomorrow Foundation made arrangements for Trevaughn to be brought to the United States for reconstructive surgery to the left orbit and an eye prosthesis at Roswell Park Memorial Institute in Buffalo, New York.